Siriki Dembele in action for Posh at Rochdale. Photo: Joe Dent/theposh.com. Peterborough United made it two wins from two League One matches at Rochdale on Saturday (August 11), but manager Steve Evans still insists you won’t see the best of his new-look team until January. 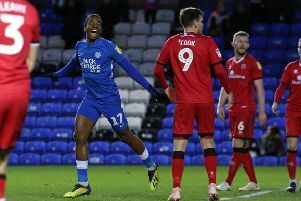 Posh ran out impressive 4-1 winners at Dale thanks to goals from midfielder Mark O’Hara (2), Matt Godden and Jason Cummings and an impressive display of wingplay from Siriki Dembele. Ivan Toney comes on for his Posh debut at Rochdale. Photo: Joe Dent/theposh.com. Evans believes Dembele could prove a better player for Posh than wantaway star Marcus Maddison. Talks were expected to continue today (August 13) between Posh an a Championship club with a view to Maddison leaving the ABAX Stadium on loan. Posh are joint second in League One after two games. “Marcus is a great player, but Siriki could turn out better,” Evans stated. “Siriki showed his quality at Rochdale. Three assists in the first-half and, while Marcus is a great deliverer of a set-piece, Siriki is on a different level. “Playing at Rochdale can be a test of character. Posh and other teams have found it difficult there in the past, but once we started to execute our gameplan properly we dominated. “There was a lot to enjoy from the whole team on Saturday, but they will only get better. I firmly believe you won’t see the best of us until January onwards so the plan is to stay in touch and then push on in the second-half of the season. “The players are still getting used to each other. “We are looking sharp up front though. The Rochdale staff told me after the game that their centre-backs found it difficult to cope with the movement of our forward players. “We are a trillion miles away from the standard the ‘Holy Trinity’ reached at this club. My teams have played against Mackail-Smith, Mclean and Boyd and you never knew where they were going to pop up next. If we can get close to that level we will be in good shape and Ivan Toney’s arrival at the club can only help. Toney came on as a second-half substitute at Rochdale. He could start tomorrow’s Carabao Cup tie at QPR, but Evans does not envisage making many changes to his starting line-up.